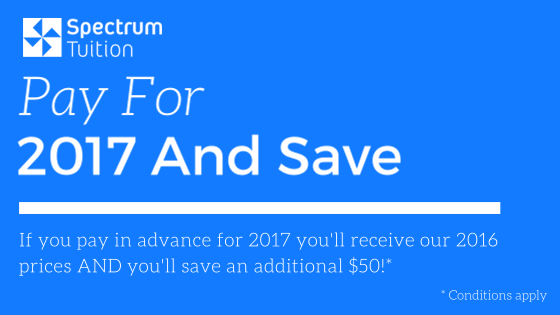 Enrolments At Spectrum Tuition Now Open For 2017 – Get An Extra $50 Off! Please note, this offer is strictly limited and will end on 10th December 2017. So if you want to save on your fees next year please make sure you enrol before the end of term 4 (10/12/2016). We have reached the end of 2016 and would like to thank all our parents, students and tutors for continuing to play an active part in our thriving community. It has been a wonderful privilege to contribute to your child’s educational journey and we look forward to maintaining a strong partnership for many years to come. Enrolments Now Open For 2017 – Get An Extra $50 Off! We are very excited to release our 2017 timetable with priority enrolments for existing students. In most cases, students should enrol in the next level up, e.g. if your child is currently doing Year 7 classes at Spectrum, they should enrol in Year 8 etc. However if you are unsure, or if you are interested in having your child sit a selective/ scholarship exam next year, please contact us and we will be able to advise you accordingly. Our updated investment schedule is attached. Students who enrol and pay their super early bird term fees or yearly fees by Saturday 10th December, will receive an extra $50 discount off 2016 prices plus access to free books to use over the holidays. To guarantee a place in your chosen classes, please enrol by Saturday 10th December to take advantage of these bonuses. You can make your payments online by simply filling in the following form/s. Free Books For Students Who Pre-enrol For 2017! For those looking for some additional materials to complete over the summer holidays, we have a number of extra course books for students who pre-enrol for 2017. Titles are strictly limited and are snapped up quickly so get in quick to get first picks. From 2017, we will be adding answers to the following week’s booklets to make it easier for students to check their understanding. For example, the week 2 booklet will contain answers to the week 1 booklet etc. Exam style questions to help you become familiar with the style and difficulty level of questions likely to appear on the exams. Cumulative tests following each key topic to build up test stamina and as an effective revision tool throughout the year! On behalf of all staff, I would like to thank you again for your continued support and wish you and your families the very best over the festive season. I look forward to seeing you again in 2017! How “Gritty” Is Your Child?